Andy is a freelance travel writer and feature writer living amongst banana plantations at the foot of Mount Teide volcano on the island of Tenerife, just 500 kilometres off the west coast of Africa. They spend much of their time trekking across goat trails in parts of the island untouched by tourism and reveling at local fiestas until dawn – all in the name of research. I was born and grew up in the north of England and had always been firmly in the ‘if I can’t plug my hairdryer in, I’m not going’ club…until eleven years ago when I finally cast off the shackles of tobacco addiction and gave up smoking. Suddenly I realized that my lungs were at least 20 years older than I was and drastic action was required. A friend suggested a camping and hiking vacation over the Easter weekend holiday and we headed out to Builth Wells in Wales. We pitched the tents in the cider orchard of an idyllic little site called Trericket Mill and every day we set off hiking into the Brecon Beacons National Park. I don’t think it stopped raining once for the whole four days. I have never been so wet or so cold in my entire life and everything was sodden and covered in mud; the tent, the groundsheet, our boots and all our clothes, with no hope of drying them out. It was one of the best weekends I’d ever had! After that we were hooked and escaped the city every weekend we possibly could to go camping and hiking around Britain. What has been your favourite outdoor recreations area? When I lived in Britain I particularly enjoyed the Lake District with its stunning mountains and lakes; tough on the thighs but easy on the soul. Second favourite was Devon with its much softer rolling hills and myriad of flower-scented trails. But since relocating to Tenerife (one of the Canary Islands located off the west coast of Africa) six years ago, I’ve been blown away by the landscapes here. I can hike through ancient laurisilva forests in the Anaga Mountains where some people still inhabit caves; through coastal palm groves and scented pine forests or I can head up to the Teide National Park at 2000 metres above sea level to hike in a 17 km wide volcanic crater at the foot of the planet’s third largest volcano. There’s a particularly stunning hike in Tenerife’s Anaga Mountains which begins in a small mountain hamlet, climbs to a high ridge and then falls down to a lighthouse and a coastal settlement of boat builders which can only be reached via a 3 hour hike or from the sea. It was an August day and we’d set off in low cloud which kept the temperatures at a pleasant level. But as we descended towards the lighthouse, we entered a different climate zone and the cloud disappeared leaving a baking hot sun. We set off back along a barranco (deep ravine) which looked about 3 km long on the map we were using. Stupidly, we hadn’t refilled our water bottles at the coast and now had less than 2 litres of water between us. The sun rose higher in the sky and the temperatures tipped 40° C with no respite from the sun. This barranco seemed to be interminable and after 2 hours we really thought that we might pass out from dehydration. We made a pact that we couldn’t drink the last drop until we saw the first house of the village. Finally we rounded a bend and saw a house on the hillside. Relieved, we sank the last of the water and dragged ourselves onwards. When we got to the house and rounded the bend we saw…nothing. The house was empty and boarded up and all we could see ahead of us was this damn barranco; what a stupid place to build a house! Clearly we finally made it back but as lessons in having adequate water supplies go, this one was hard learned. We were following a trail to a waterfall in Langkawi, Malaysia once and a large, male Macaque monkey was on the trail ahead of us. We kept a reasonable distance but clearly the monkey felt threatened because he suddenly turned and charged us. I have to say that at this point we were absolutely pathetic. Panic stricken, we both ‘hid’ behind our outstretched rucksacks and tried to back away. Jack was recording the incident on video and I was hissing at him to put the video down and concentrate on getting us out of there without injury (except I think the words I used probably included at least one that began with an ‘f’). After a couple more charges, bared teeth and a lot of screaming (mainly from us), the macaque finally let us pass. On our return home we eagerly lined up the video to show our friends this exciting wildlife encounter. But when it came to ‘that scene’ we couldn’t believe the footage. We felt really stupid. In our minds, we’d built this thing up into some kind of King Kong lookalike and there it was, no more than a small primate who was mightily annoyed at what he interpreted as threatening behaviour from us. It supplied our friends with ammunition for months. We’ve given apes a very wide berth ever since. 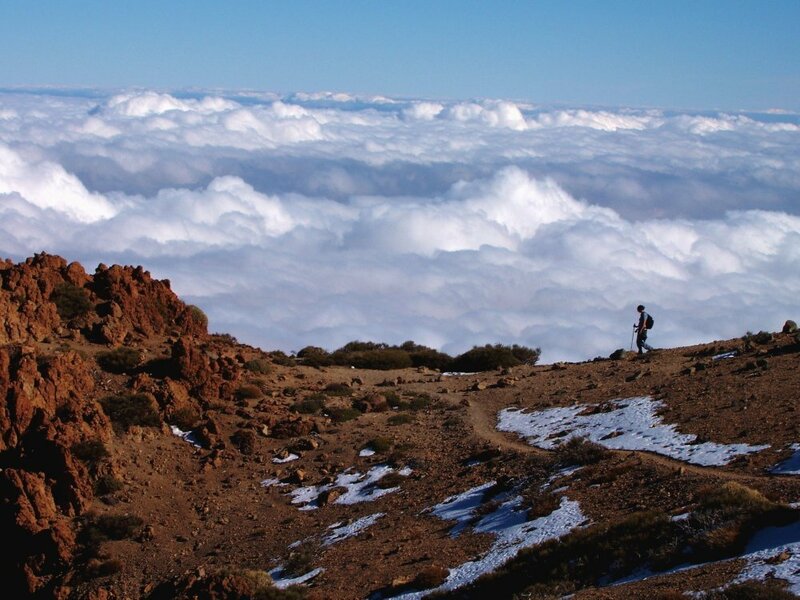 Well clearly, Tracks and Trails is right up there…alongside our own website which specializes in discovering the Tenerife that lies beyond the beaches, particularly its amazing hiking trails.